Sanofi US is voluntarily recalling ALL Auvi-Q®(epinephrine injection, USP). 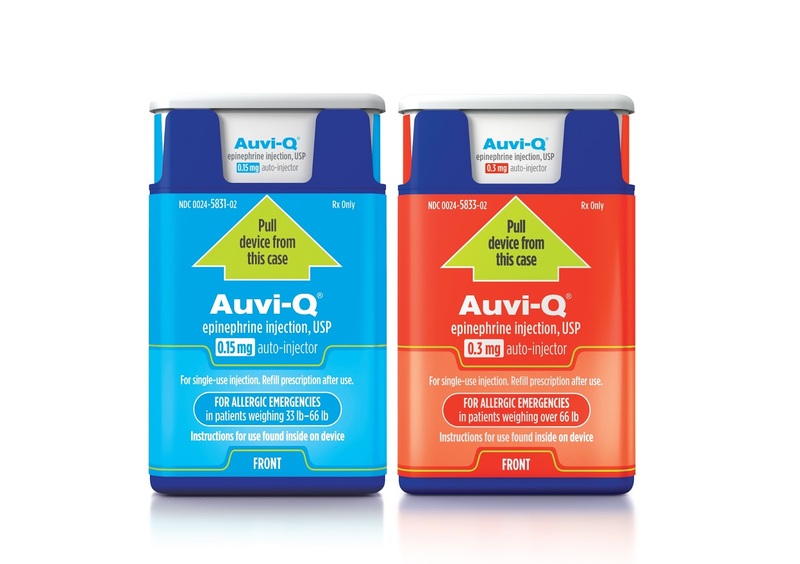 The recall involves all Auvi-Q currently on the market and includes both the 0.15 mg and 0.3 mg strengths. Includes lot number 2299596 through 3037230, which expire March 2016 through December 2016. Sanofi US is notifying it’s distributors and customers who include doctors, pharmacies, wholesalers and other customers in the supply chain by letter, fax, email and phone calls and is arr anging for return and reimbursement of all recalled products. Customers with questions regarding this recall can go toAuvi-Q.com and call 1-866-726-6340 Monday through Friday 8 a.m. to 8 p.m. ET for information about how to return their Auvi-Q devices. Customers may also email cs@sanofi.com. Sanofi US will provide reimbursement for out of pocket costs incurred for the purchase of new epinephrine auto-injectors with proof of purchase. Customers should immediately contact their healthcare provider (HCP) for a prescription for an alternate epinephrine auto-injector. Halloween Can Be Scary – If You Have Food Allergies! Halloween can be a frightening time if you or someone in your family has a food allergy. Candy with potential food allergens seems to be lurking around every corner this time of year. As a result, trick-or-treating can be a perfect disaster between the excitement, the candy and the darkness! But if you have a plan for Halloween, you can take the FRIGHT out of the NIGHT! Here are a few ideas to incorporate into your trick-or-treating plan. Be sure to discuss these points with your children before heading out to eliminate any surprises. Be clear from the beginning that there will be no eating while trick-or-treating. You might want to bring safe snacks from home or feed your kids prior to leaving. Do not put yourself in a position of having to read labels and make decisions in the dark and away from home. Once you are home, inspect all candy for potential allergens. Keep in mind that “Fun-sized” treats may have different labels than the normal-sized treat. Be sure to inspect all labels carefully. Your unwanted candy can be donated to several different organizations, such as those that send care packages to U.S. troops. Click here for options for donating candy. Consider avoiding trick-or-treating altogether. Instead plan a new family tradition of a movie and popcorn at home, board games or even a craft night! We hope that following these guidelines will help you and your family enjoy a fun and safe Halloween. As always, contact us with any questions or concerns. Happy Halloween! There are certain types of insects that can cause allergic reactions. Most people know about bees and fire ants, but there is a caterpillar that can cause allergic reactions too. The Douglas-fir Tussock Moth caterpillar is covered with small hairs which may cause allergic reactions in some people and some pets. The typical reaction includes rash, hives, redness and itching of the skin, sneezing, runny nose and watery eyes. The reaction is called “Tussockosis”. The caterpillars must touch your skin in order to cause the allergic reaction, it is not airborne. Douglas County currently has high levels of tussock moths and caterpillars. The Douglas-fir tussock moth caterpillars are a native species that primarily feed on Douglas fir needles. According to the Douglas county website, the current tussock moth caterpillar activity is occurring on both private and US Forest Service lands between Perry Park and Valley Park, areas off Dakan Road and west of Pine Creek Road. If rash occurs, treat with Over-The-Counter anti-itch creams and anti-histamines. If the rash is significant or the medications are not working, contact our office. Contact us with any questions or concerns, and have a fun and safe summer! We’ve all had mosquito bites, but for some, those bites are larger and more troublesome than normal. This type of reaction to a mosquito bite may be an allergy to mosquito saliva called Skeeter Syndrome. Almost all mosquito bites have some redness and itching, but with Skeeter Syndrome, the bites are very swollen, extremely itchy and often last for days. The bite site also may be warm to the touch, and the skin can even break down and ooze. This type of allergic reaction is rarely serious or life threatening, but it can be very uncomfortable and, at times, temporarily disfiguring. In people with a significant history of reaction, allergy shots can be used to treat Skeeter Syndrome. But for most, there are other options. Avoidance is very important and includes wearing long sleeves and pants in areas with mosquitoes. It also is very important to apply mosquito repellent. Finally, if someone has a history of Skeeter Syndrome, pre-treating with antihistamine will lessen the reactions. Once bites are noted, treating the site with ice and a topical antihistamine or steroid also can help. If you are concerned about Skeeter Syndrome, please contact us (303-706-9923 or www.allasth.com). Enjoy your summer, and remember to use insect repellent! Patch testing is another type of allergy testing that you may not have heard about, but it can be very helpful and effective. Its technical name is Delayed Type Hypersensitivity Testing, and it has been around for more than 100 years! The first patch testing studies were used to determine the poisonous parts of certain insects. Today we use patch testing to determine allergies that do not show up with scratch/prick testing or blood allergy testing. Patch testing can test for an allergy to metals (such as nickel), preservatives, fragrances, additives, dyes and even natural products, such as lavender or tea tree oil. Patch testing can also be used for certain types of food allergies. Patch testing is often used in patients with a rash that will not go away, in patients who have trouble when metal touches their skin, or in patients with stomach issues that might be caused by allergies. Patch testing is quite different from scratch/prick skin testing. During patch testing, the different substances are placed on your skin (usually your back) and held in place with large stickers designed for this purpose. The stickers and allergens are left on your skin for two days and then removed. At that time, early reactions may be seen, but the final interpretation of the test will occur in one to two more days. At the final visit, positive results will be reviewed, and you and your allergist will determine if the results are relevant to your unique situation and symptoms. Contact us at 303-706-9923 if you have any questions. As you may know, a recent medical publication will likely change our approach to food allergies in our youngest patients. The LEAP (Learning Early About Peanut Allergy) study was published in the New England Journal of Medicine, one of the premiere journals in the medical community. The study suggests that we can prevent peanut allergy by feeding young patients peanuts regularly. This study will likely go down as key research in the world of food allergy science, but it is important to understand what this study really means and what it does not mean. This study included 640 young children with severe eczema, egg allergy or both severe eczema and egg allergy. The children were very young – four to 11 months of age. All were skin tested to peanut before the study. A large number had a negative skin test to peanut and a small number had a small positive result to peanut. Then each patient was either placed in a group told to intentionally avoid all peanuts or in a group told to regularly eat peanuts. After five years, the researchers looked at how many kids were allergic to peanuts. It is important to note, that if a child had a significant skin test to peanut prior to the study or did not have severe eczema or an egg allergy, they could not be in the study. This is something to consider when determining if the results are applicable to other children. After five years, the researchers found that in the group that had negative skin testing to peanut at the beginning, almost 14 percent of those kids who intentionally avoided peanuts were now allergic versus only 2 percent of the children who regularly ate peanuts. And for the group of kids with a small positive to peanut skin testing at the start of the study, 35 percent of the avoidance group were now allergic compared to only 11 percent of the peanut-eating group. This suggests that eating peanuts starting at a young age may decrease the risk of being peanut allergic at age five. However, we need to keep in mind that this study had a specific population that either had severe eczema rash or already had an egg allergy. They also only looked at patients without a history of previous peanut reaction and very small positive peanut skin test results. Nonetheless, the idea of exposure rather than avoidance in an “at risk” population is pivotal information that will likely change our approach to food allergy as we move forward. References: Du Toit, G et al. Randomized Trial of Peanut Consumption in Infants at Risk for Peanut Allergy. N Engl J Med 2015; 72:803-813.